Oh summer… don’t go away. I’m a grilled vegetable fanatic and summer means…tomatoes, zucchini, eggplant, potatoes, bell peppers, mushrooms, corn. And it also means BBQ! Is there any veggie you can’t grill? I don’t think so. Just throw one to me and I’ll come up with a way. If you’ve never tried grilled vegetables then you are missing one of yummiest flavors in the world! Those natural sugars all caramelized. Slow heat + Time + Vegetable = Natural sweet yummy goodness. I like them just plain or with a sprinkle of garlic salt and a drizzle of balsamic vinegar. Think caramelized onions times 10! The best part is they keep for a couple days in your refrigerator and can be used to liven up your pastas and soups all week long. During the summer we grill something at least 3-4 times a week so throwing a veggie or two on the grill to keep the meat company just seems natural. I LOVE, no I double love my BBQ veggie grill pan for this reason. Its just one of those pans with holes made just for the BBQ. Makes grilling anything that can fall through the grill (think veggies and shrimp) so much easier to prepare. Okay, so I got off track. 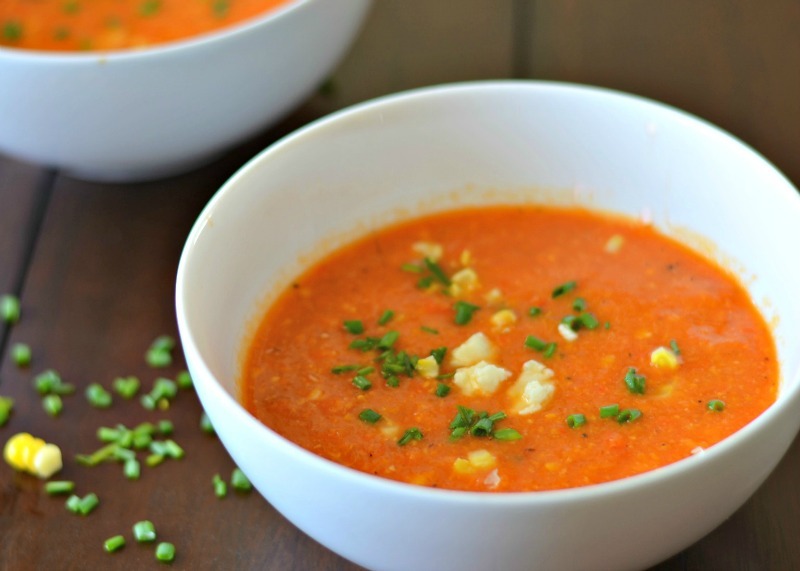 But this Roasted Tomato, Pepper and Corn Chowder recipe starts with grilled veggies so that is why it caught my eye. The grilling amps up the sweetness and then with a sprinkle of blue or goat cheese on the finished chowder will make ALL your taste buds happy. Note: I adapted the original recipe I found on Cooking Light to include ‘canned” roasted tomatoes. Why? Have you ever tried to roast a tomato on the grill? Not a pretty sight. And not very easy. I’m all into EASY this summer so I just grilled the peppers and corn and took the low road on the roasted tomatoes. If you don’t agree, go right ahead and peel and roast those red ripe tomatoes. Your chowder will be better than my chowder…I’m sure. Big wink. Preheat your grill to medium hot. Arrange bell peppers, skin side down along with the ears of corn on the grill. Grill for 5-8 minutes turning the corn to get it slightly charred on all sides. Remove from the grill and let it rest until its cool enough to handle. 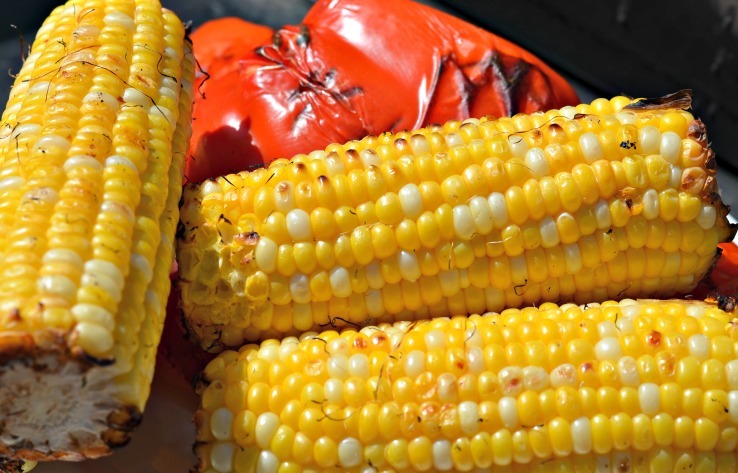 Cut the corn kernels from the ears of corn and chop the red pepper into big chunks. Heat oil in a large soup pot and add onion. Sauté the onion until its translucent about 7 minutes. Add the tomatoes, red bell pepper, corn and chicken broth to the onions mixture and bring to a boil. Reduce heat and simmer for 30 minutes or until veggies are tender. Cool 15 minutes and then using an immersion blender, blend until smooth. Or if you don’t have an immersion blender, place one-third of the tomato mixture in a blender and process until smooth. Pour this into a bowl and repeat with another third and finish. Season with salt and pepper to taste. Pour everything back into your pot and reheat. Serve in bowls. Top each with a sprinkle of chives and a teaspoon of cheese if desired.